Despite the early promising discoveries of oil and gas in Senegal and Benin in the 1960s, hydrocarbon development in the Central Atlantic continental margin has been slow - until recent and continuing exploration success have turned it into an exploration ‘hot spot’. Historically the Central Atlantic continental margin has shown much promise for the development of hydrocarbon plays and discoveries, since the discovery of small onshore gas fields in Senegal in the early 1960s, small offshore oil fields in Benin in the late 1960s, and larger, but sub-commercial heavy oil offshore Senegal, also in the late 1960s. Despite this early proof of viable petroleum systems and subsequent steady exploration activity, significant developments have been slow to arrive. However, recent exploration success means the outlook has changed dramatically. 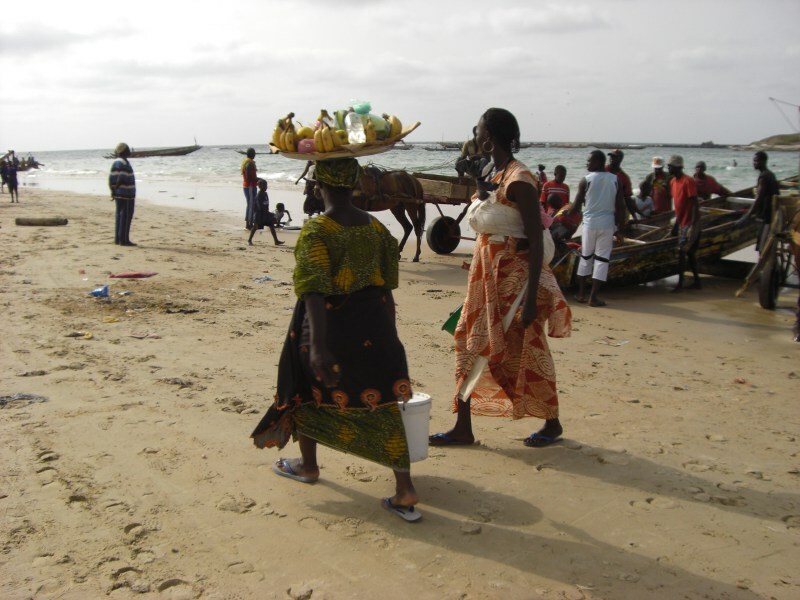 Senegal beach scene. Recent E&P activities have inevitably been cautious in the current economic climate but there are significant ventures that ensure that the area remains one of focus. Of note are: the start-up of the TEN development in Ghana by Tullow and partners, slated for mid-2016; appraisal of the Tortue West gas discovery by Kosmos in Mauritania/Senegal and proposed exploration of the same Albian-Cenomanian fairway in a nearby prospect; and further appraisal of the Albian SNE-1 & -2 oil discovery in Senegal by Cairn, with additional targeting of supplementary pools in superjacent Cenomanian reservoirs, for example by the recent BEL-1 well. Has the discovered resource base realised earlier expectations? What is the likely scale of potential resource growth? What are the key constraints and technical risks? 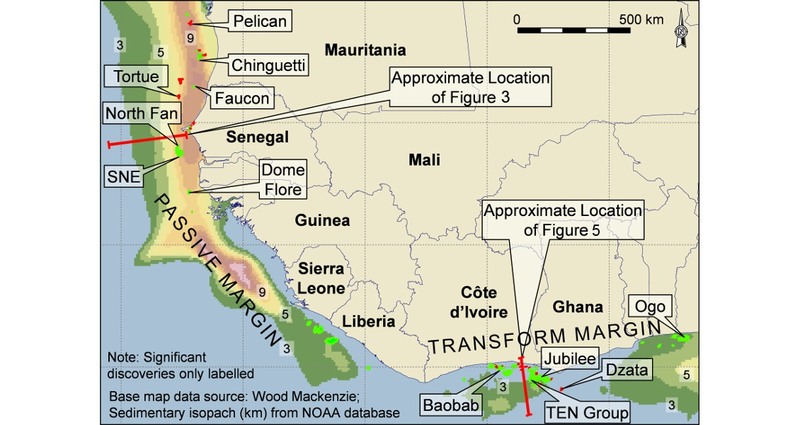 •	Transform Margin comprising the Cote d’Ivoire and Keta-Togo-Benin sedimentary basins, in the countries of Cote d’Ivoire, Ghana, Togo, Benin and western Nigeria. Although distinct in their geological histories, both areas have in recent years been rejuvenated by exploration programmes targeting novel structural and stratigraphic plays in Cretaceous and Tertiary sandstone reservoirs. Carbonate plays in the Jurassic have also been addressed by recent exploration on the Moroccan margin, and there is deeper upside in the syn- and pre-rift sections; although these remain of interest, they are not addressed here. Figure 1. Location of principal oil and gas fields and total sedimentary isopach (km). Palaeozoic precursor sedimentary basins exist beneath the Passive Margin, some with hydrocarbon potential, and indeed Ordovician to Silurian source rocks are instrumental in the onshore petroleum plays. However, the present offshore basin configuration was initially defined in Triassic time by the formation of lacustrine to marginal marine rift basins, locally evaporite-bearing, that characterise more widely the North and Central Atlantic areas. Salt is present in two sub-basins offshore Senegal/Guinea Bissau and offshore Mauritania. It is significant in trap creation by diapiric movement and controlling extensional structural detachment, and also may locally influence source rock maturity. Figure 2. Locations of main deltaic depocentres and sedimentary isopach (km). (Partly after Davison, 2005) Continental break-up followed the regionally extensive volcanic activity of the Central Atlantic Magmatic Province in the Early Jurassic. Drowning of the newly-formed ocean margin led to the predominance of carbonate sedimentation in the remainder of the Jurassic with creation of a prominent shelf edge and associated carbonate build-ups, but was replaced by clastic deposition and the progradation of major deltaic systems in the Middle to Upper Cretaceous and Tertiary. Localisation of clastic input (Figure 2) changed with time, and understanding of the evolution of the palaeodrainage has been one of the important breakthroughs in exploration of the area. Deltaic influx was responsible for both the deposition of reservoirs and the burial and creation of hydrocarbon source kitchens in source rocks of Jurassic, Lower and Upper Cretaceous age. Historically, source rocks have been mostly attributed to the Turonian-Cenomanian and Albian as the result of regional ‘oceanic anoxic’ marine source rock events, but there is evidence for local variability in source rock quality that defines kitchen extent, and also for older, Aptian and Jurassic source rocks leading to a growing diversity of petroleum systems. The approximate sedimentary isopach in Figure 1 reflects both the position of the early rift basins and, especially, the localisation of the later deltaic depocentres (Figure 2) which control reservoir occurrence, and burial and maturation of source rocks. 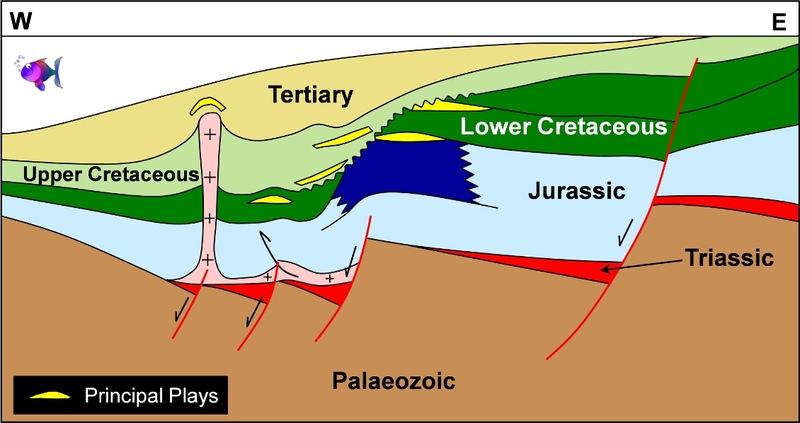 Reservoir distribution is also affected by the uplift, rotation and erosion of the shelf edge during Late Cretaceous times, especially in the centre and south of the area, where this feature leads to a distinct assemblage of hydrocarbon plays (Figure 3). These processes created a steep bypass zone that led to reservoir sandstone deposition in deeper water settings during sea level lowstands. Erosion also created channels and canyons that both localised subsequent sandstone deposition, and resulted in truncation of underlying rocks that influenced trap formation. Figure 4. Principal oceanic transform fault ‘fracture’ zones and sedimentary isopach (km). Although initial Early Cretaceous extension on the Transform Margin was controlled by normal faulting, the structure is now dominated by major transtensional strike-slip systems continuous with the Saint Paul and Romanche oceanic fracture zones (Figure 4). Transtension was initially (Albian to Cenomanian) between continental West Africa and South America, and then between Africa and the newly-emplaced oceanic crust in Cenomanian to Santonian times. Strike-slip motion led to some modification and inversion of previous purely extensional features to create the structural traps seen today. The Santonian marks the end of active transtension and the commencement of a more passive margin history, although with an abrupt continental margin inherited from earlier phases of the basins’ history. Reservoirs of Cretaceous age are exclusively clastic and were deposited in both shelfal and basinal settings, with hydrocarbon sourcing principally from Albian to Cenomanian source rocks. The main plays are stratigraphic and combined structural-stratigraphic traps, relating to the partly inverted and modified transtensional faulting (Figure 5). The regional sedimentary isopach in Figure 1 shows the position of localised depocentres corresponding approximately to kitchen areas between the major strike-slip/fracture zones (Figure 4), and suggests that the viable exploration fairway may be limited by the depth of burial and maturity of the source rocks. Thick sedimentary section is mapped as extending into deep water (> 3,000m), in areas inferred to be transitional continental and oceanic crust, with consequently lower levels of predicted thermal maturity. The course of exploration in Central Atlantic Africa is depicted here via ‘pseudo creaming curves’ which show the historical growth of cumulative potentially recoverable resources assigned to each of the major ‘play groups’ (Figures 6 and 8), and the distribution of discovered pool sizes are shown in Figures 7 and 9, as a means of comparing the plays and their historical development. All data are shown with all hydrocarbon phases reported in MMboe . This is a simplification, but it is sufficient to show the general trends. Key discoveries in the plays’ development are identified on the graphs, and on the location map. They record the innovation in play concepts along with the growing capabilities to operate in the water depths of the continental slope; only six wells were drilled prior to 2000 in water depths greater than 500m, but recent drilling has exceeded 2,700m water depth in both Passive and Transform Margin areas. 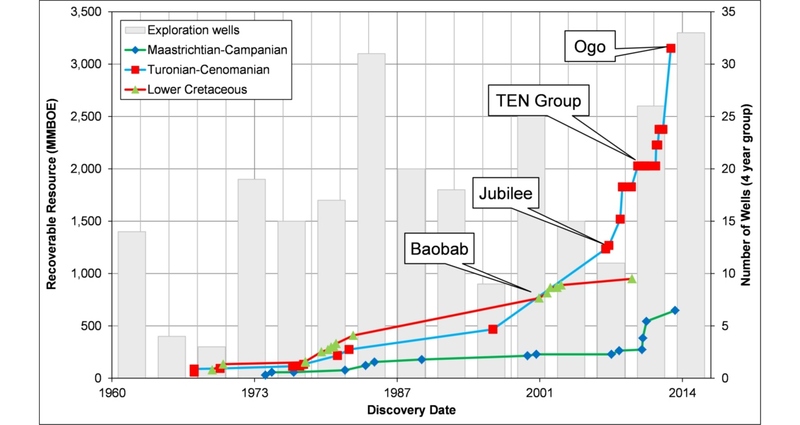 Tertiary plays: Early exploration on the Passive Margin (Figure 6) was led by the discovery in the 1960s of the Dome Flore Field, containing a large undeveloped volume of biodegraded, heavy oil (10° API) in an Oligocene carbonate reservoir above a salt dome. This has been assigned a recoverable resource of 300 MMbo, but recovery factors remain very uncertain. 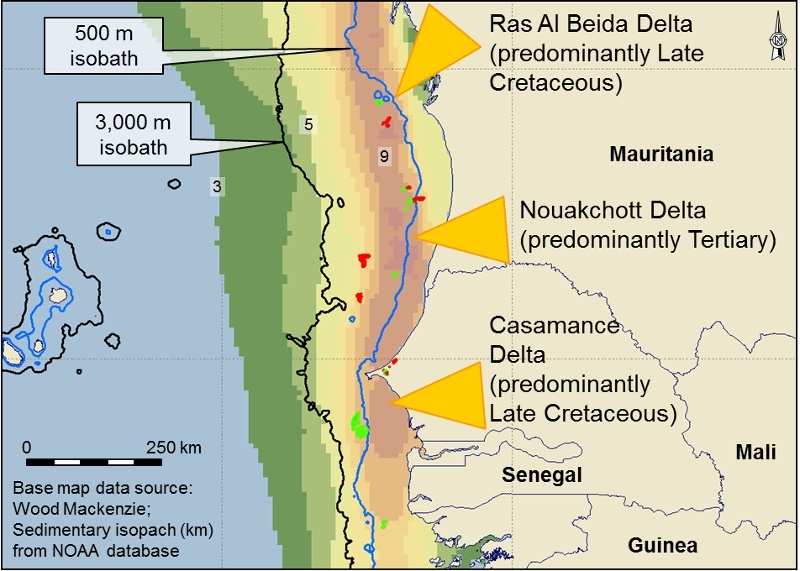 Chinguetti is a small oil discovery in Tertiary sandstones, again on the flanks of a salt dome (recoverable resource of 41 MMbo), but which demonstrated the reservoir potential of the Nouakchott delta and the potential for hydrocarbon generation in the underlying Upper Cretaceous kitchen. 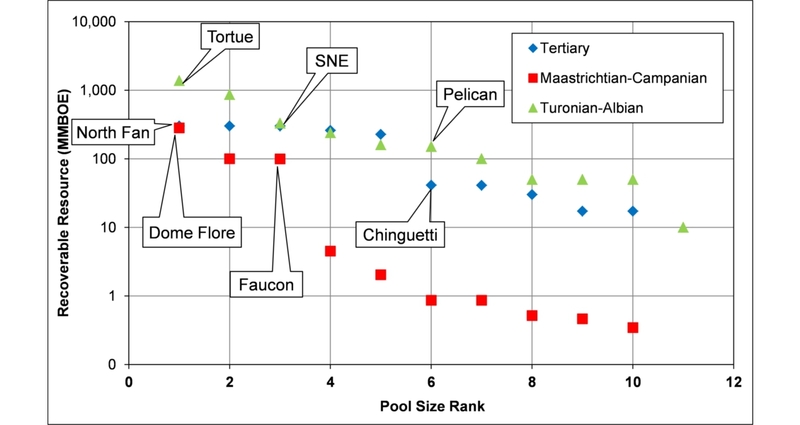 There has been some subsequent growth in the Tertiary play in larger pools with a greater component of stratigraphic trapping (Figure 6), but the main play fairway is likely restricted to the principal Tertiary delta system (the Nouakchott Delta). Potential outside of this core area may be limited due to localised reservoir distribution and vertical migration routes associated with salt piercements (e.g. Chinguetti) , reflected in the more recent tail-off and hiatus in this play’s development (Figure 6). Significant prospects of comparable size to the largest discoveries (Figure 7) are proposed by operators in both the northern and southern parts of the basin, but these are at shallow depths of burial, away from the principal deltaic depocentre. There may be significant seal and migration risks and/or potential for biogenic gas only. Upper Cretaceous (Maastrichtian-Campanian) plays: Faucon was the first significant offshore discovery (recoverable resource assigned 100 MMbo) and demonstrated the trapping potential of salt domes in Upper Cretaceous sandstone reservoirs. The scale of this discovery is an order of magnitude greater than the earlier fault-related structural traps onshore (Figure 7). Additional prospects of this type are proposed by operators in the area, but are likely of high structural risk. Of greater significance is the Maastrichtian to Campanian play demonstrated at the North Fan discovery (recoverable resource 282 MMbo). This has shown the potential of this reservoir immediately beyond the palaeoshelf edge in a trap apparently partly stratigraphic and partly controlled by structural drape over underlying drowned shelf edge highs. There is a string of other opportunities in the southern part of the area and growth of this play in this Casamance deltaic depocentre is likely, theoretically with future discoveries paralleling the resource growth in the older plays (Figure 6). This stratigraphic play is not proven more widely to the north in the Nouakchott delta which is predominantly a Tertiary feature, and if it exists, present day bathymetry may prove a constraint. It is invoked in the far north of the basin by operators in the Ras al Beida depocentre, with prospective pool sizes comparable to the discoveries further south. The risk here may be the presence of feasible hydrocarbon migration from areas of greater Tertiary burial to the south. In general the risks with this group of plays are in the viability of purely stratigraphic traps and the existence of migration paths in the absence of direct contact of the reservoir with source rock at the underlying unconformity and/or shelf edge faulting. Lower to Upper Cretaceous (Albian-Turonian) plays: Much of the recent growth in recoverable reserve volumes for the basin is driven by the Albian to Cenomanian plays. Initial resources assigned to this play were at Pelican and adjacent Fregate which both proved the potential of Turonian channels at the palaeo-shelf and also viable hydrocarbon charge in the northern part of the basin. More recent growth has been as a result of combined stratigraphic (depositional and erosional ‘buried hill’) and structural traps at the palaeo-shelf edge, especially Cairn’s SNE-1 structure (median recoverable resource 330 MMbo) and further exploitation of this trend is planned, both within the proven Albian sandstones and in the extension into the Cenomanian, as for instance in Cairn’s recent Bellatrix-1 well. Additional prospectivity is defined in the Turonian sands within channels on the eroded slope, and within lowstand bodies in deeper water settings. Most recent success (Figure 6) in this play group has been in gas discoveries including Tortue/Gembuel on the Mauritania/Senegal border, where Cenomanian age sandstone reservoirs have multi-TCF recoverable resources assigned in combined structural-stratigraphic traps. This discovery also implies deeper gas mature kitchens of Lower Cretaceous (pre-Albian age), that furthermore might be at oil window levels of maturity in deeper water areas on the fringes of the deltaic depocentre, with lesser burial. These developments strongly imply further petroleum system diversity beyond that associated with the Albian-Turonian source rocks. Public data provided by the operator would indicate that the wells drilled so far are at the optimal heart of the fairway in robust, essentially structural closures. These anticlines most likely relate to the underlying salt diapirism and/or gravitational structures detaching on the salt. It is inferred that future discoveries relying on more subtle structures may be smaller in scale than those made so far. The combination of seismic attribute and AVO analysis has proved successful in exploiting the gas play, but trap and reservoir definition may prove more challenging in exploiting smaller, oil-filled traps. More generally, published prospect volumes for this group of plays suggest that discoveries may be made in the middle of the range pool volumes discovered to date (Figure 7) (100-200 MMbo), resulting in a typical future flattening of the ‘pseudo creaming curve’ (Figure 6). This play has had some success on the Liberian margin, but published prospect volumes suggest that significant upside beyond the scale of what has been previously discovered (e.g. Montserrado with a recoverable resource of 160 MMbo) may be elusive. Upper Cretaceous (Campanian- Maastrichtian) plays: Figure 8 shows steady growth of this component of the basins resources but with no large discoveries described by the available public data. The latest discoveries are of gas and condensate at Gye Nyama and of oil at Saphir, at the extreme east and west of the area respectively. The former field is the largest reported in the play (160 MMboe recoverable resource) and represents part of the fairway with clear migration links to underlying Turonian plays. The extent of this play component is not certain. There has been some recent growth in the resource associated with the Upper Cretaceous (Maastrichtian-Campanian) play but this may be restricted in extent by localised migration routes around significant reactivated fault trends and/or close stratigraphic proximity of overlapping sand systems, and the technical and commercial constraints imposed by water depth. Additional potential is defined in significant prospects beyond Saphir to the west and, although this well is important in partly de-risking that part of the basin, sedimentary thickness and possibly kitchen maturity is expected to decline westwards as a key risk. 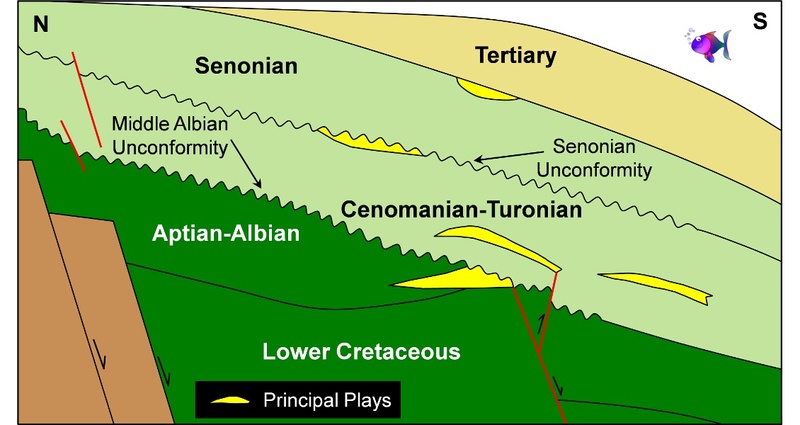 Upper Cretaceous (Cenomanian-Turonian) plays: In contrast to the later play, the Cenomanian to Turonian interval has shown extremely rapid growth from the early 2000s, following its more gradual earlier development (Figure 8). This is driven partly by the key discoveries at Jubilee, and the TEN area, both formed of composite Turonian channel and fan complexes draped over underlying structural highs, with closure updip provided by stratigraphic pinchout and/or faulting. In contrast to the Passive Margin basins, structuration relates to the modified and partially inverted structural fabric of the Lower Cretaceous syn-rift that has created a series of steeply down-stepping terraces on the continental margin which localise slope and basin floor channel and fan deposition. 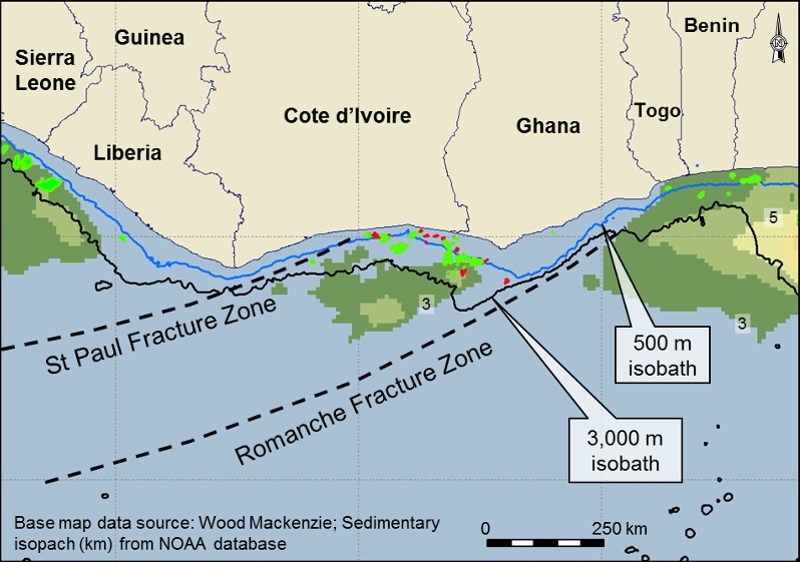 In addition there are the Sankova East discoveries in the Cote d’Ivoire Basin, and Ogo-1 in the neighbouring Keta-Togo-Benin Basin structures near the fringes of the play fairway. Ogo is a structural trap over an underlying fault block. Resource volumes quoted are high, but part of the 775 MMbo recoverable resources attributed may possibly be more correctly considered in the Albian and other Lower Cretaceous reservoirs, a separate play group. Lower Cretaceous (Valanginian-Albian) plays: Structural plays in the Lower Cretaceous are dominated by Baobab, a large anticlinal combined structural-stratigraphic trap, and this stands out when compared to other fields in this play (Figure 9). An interesting additional discovery may prove to be Dzata, which has demonstrated a structural trap directly associated with compression along the Romanche Fracture Zone which may possibly reinvigorate this play. This play benefits from close proximity to source rock intervals. 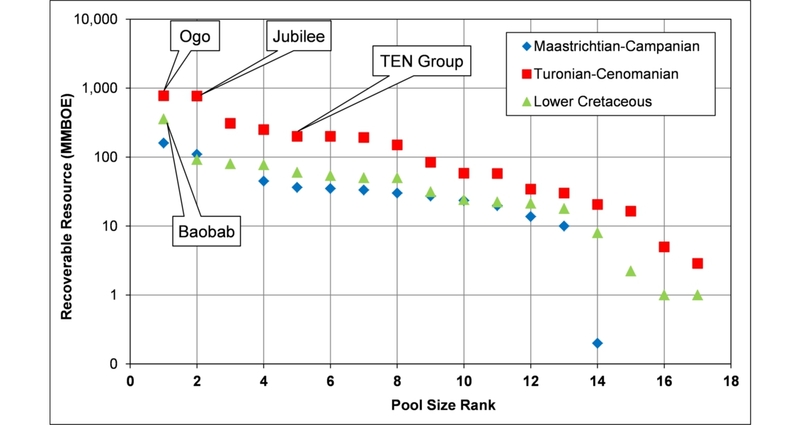 It is likely that further discoveries will be comparable to the main field size distribution rather than the outlier of unusual resource volumes at Baobab (Figure 9). 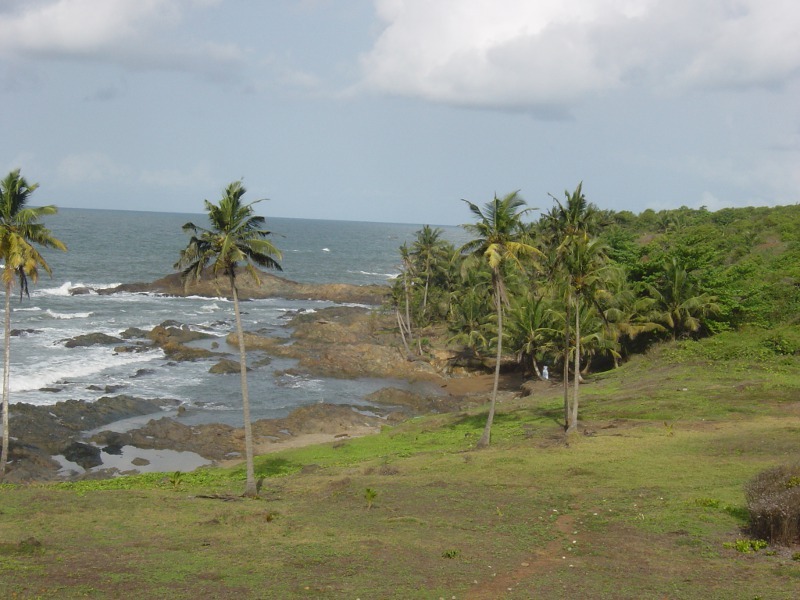 Ghana's Central Atlantic coastline. Resource growth can be compared to previous yet-to-find (YTF) estimates for these basins made by the USGS (2003, 2006). Definition of new potential over the last decade is generally in line with the predictions made by the USGS in YTF assessments for the Transform Margin, where median undiscovered (in 2006) recoverable resources were estimated to be 2,628 MMboe, compared to actual reported recoverable resource growth since that time of 3,163 MMboe. For the Passive Margin, however, growth in the hydrocarbon volume base has greatly exceeded the USGS predictions (2003). Actual additions of 3702 MMboe since that time are more than 13 times the median estimate of undiscovered recoverable resource at that time. This improvement results from recognition of multiple hydrocarbon source kitchens, beyond the then established Turonian-Cenomanian mudstones, and of new reservoir-seal couplets as the basis for hitherto unrecognised plays. It is notable that recent exploration has been driven by independent exploration companies which have responded to the opportunities offered in an environment of relatively attractive fiscal and contractual terms. 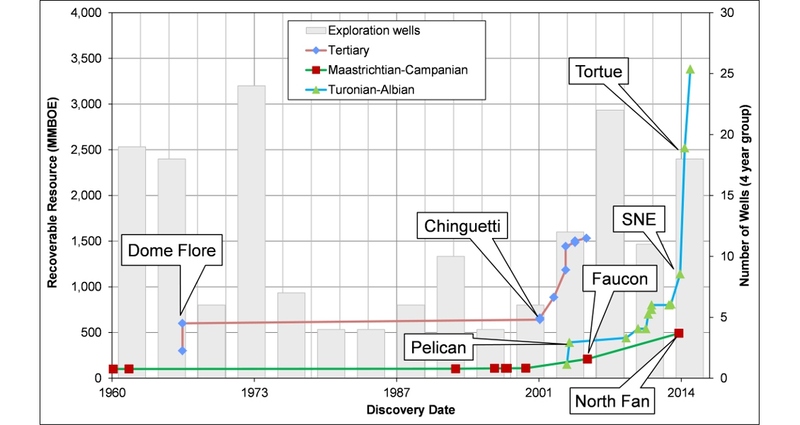 Overall the study area is one with a long exploration history, but where recent exploration successes have reinvigorated and increased play diversity with future prospects of resource growth. Relatively attractive fiscal and contractual terms appear to have played a part in making the area one of focus for a small group of independent oil companies. On the Passive Margin the resource base has greatly exceeded earlier YTF predictions, as a result of increased petroleum system and play diversity. On the Transform Margin the resource base is approximately in line with the YTF predicted previously. Future significant Passive Margin resource growth is expected in the Maastrichtian-Campanian basinal play, with potential for discoveries with a scale comparable to the largest of those currently existing. Principal risks are in those in definition of stratigraphic component of trapping and in the demonstration of viable migration pathways. There is potential for further exploitation of the Albian to Turonian plays on the Passive Margin, although scale is expected to be reduced from the recent major discoveries. The combination of seismic attribute and AVO analysis has proved successful in exploiting the gas play, but trap and reservoir definition may prove more challenging in exploiting smaller, oil-bearing traps. Growth in Tertiary plays is expected to be limited due to localised reservoir distribution and reliance on vertical migration routes associated with salt piercements. Additional significant growth on the Transform Margin is possible in all Cretaceous plays, but may be limited by the existing kitchen areas. For the Middle and Upper Cretaceous plays on the Transform Margin, controls may be additionally exerted by localised migration routes around significant reactivated fault trends and/or close stratigraphic proximity of overlapping sand systems. This review has been conducted using only public domain data and that synthesised from analysis of third party datasets to which GCA subscribes, identified and acknowledged where relevant below. GCA works actively in this area for a number of clients in supporting the exploration, appraisal and commercialisation of oil and gas opportunities, but no proprietary data have been accessed in this review. Davison, I, 2005. Central Atlantic margin basins of North West Africa: Geology and hydrocarbon potential (Morocco to Guinea). Journal of African Earth Sciences. V. 43, p. 254-274. Wood Mackenzie Petroview database (accessed and presented with kind permission). Company websites for African Petroleum, Anadarko, Azonto Petroleum, Cairn Energy, Cap Energy, Chariot, Dana Petroleum, ENI, Genel, GNPC, Hess, Kosmos, Oryx Petroleum, Petroci, Petroguin, Petrosen, Svenska, Total, Tullow, Vanco.